BRAVEAURORA sees the benefits of having children growing up in their families and believes that it is better to grow up with their own parents, close relatives, or proper foster parents than in institutions. 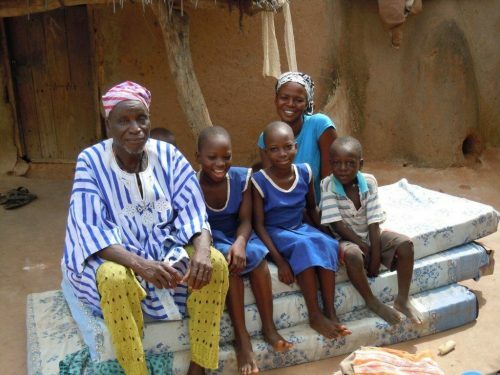 The opening of new orphanages in Ghana is prohibited by law, as the de-institutionalization and reintegration of orphans in family structures is also sought by the Ghanaian DSW. Nevertheless, according to the organization Orphanaid Africa, there are 148 orphanages in Ghana (which are officially registered with the Ministry of Family Affairs according to current information) and 11, which are still operating. Reintegration means to reintegrate orphans from the orphanages into their extended family structures. BRAVEAURORA has supported the orphanage in Guabuliga since 2009. Many of the children, from the ages of 2 to 15, had one parent or relatives from their extended family. An important milestone was the gradual integration of all 45 children from the orphanage into their families in Guabuliga. With the concept of reintegration and the successful return of all children to their extended families, BRAVEAURORA is a pioneer in this field throughout Ghana. The reintegration measures designed at that time agreed with the Ministry of Family Affairs and a separate, comprehensive reintegration manual was drawn up for this purpose. This shows in detail the procedure, processes, and necessary analyses as well as necessary support packages for the families of the orphans. The aim is to extend this pioneering work to the north of Ghana, to stop the opening and continuation of illegal orphanages and to give the children a bright future. BRAVEAURORA is proud to be a co-operation partner in the field of reintegration of UNICEF Ghana.